Those of us with interest in photography often end up with a collection of cameras – too many to take along for travel or for all the various activities we may engage in. Optrix sells a number of cases which may help sports and hobby enthusiasts to cut down on that number! In many ways, an Optrix case turns your iphone into a GoPro. In fact, in terms of various features it may do even better! Before we get into the meat of the review, let’s discuss what this case is and what it isn’t….. It would take a decent sized quadcopter to fly the Optrix and iphone as a POV camera on their quadcopters. The iphone 4S is probably too heavy for any normal work, but the Optrix and the iphone 5 may be an option for some. Also, you can use these cases for various models of the ipod touch, which are also lighter in weight. iPhone 5 with Optrix XD5 case and smaller mount (other mounts could easily be devised to save weight) – Less than 200 grams, which could be flown by a DJI Phantom or many other smaller quads. Various other configurations could easily be flown – for instance, some of the cases don’t have the wide angle lens and others accept the ipod touch models (various generations). The Optrix can also be used for various other parts of your drone life – including following along with your flights when your drone is close by. You can chest-mount or helmet mount the cam and take nice POV videos for operating instructions, etc. You can also use it to document repairs and other close-up work on your workbench. Of course, you can also use this case for hiking, biking, hang gliding, sailing and various other activities which you wish to document. One question which might come up is whether you need the wide angle lens model. Below are two videos taken in the same basic location following a small quadcopter – one is with the wide angle and the other without. The other videos at the end of this review are all with the wide angle lens. The wide angle will make it easier to keep a larger area in the frame – and perhaps provide your viewers with a more immersive experience. However, for some close-in work, such as detailing some modification you performed with a soldering iron, a well aimed mount without the wide angle may be better suited. Note that if you use requires the waterproof feature, you must make the decision about wide angle or not before purchasing your Optrix. The wide lens cannot be removed – your only option for narrower shots with the wide-angle model is to prop the case end open! Optrix went all-out on these cases! They are built to a standard, not for a low price. They use very high quality materials and have been tested to many times the shock of other cases. Time will tell, but my guess is that my iphone will wear out long before this case does. This is probably the best kept secret of the iphone vs. various other action cameras. Your iphone (4S and 5) are great video cameras! They have amazing stabilization and other features built right in. Your iphone already has the extra features such as GPS built right into it, so you can track where your videos are taken. In addition, you have access to various apps and settings which are much harder to access on other sports cams. Your phone also has lots of built in storage and easy access to share and export video and still photos. In short, no stand-alone action cam can possibly provide all the features that your iphone can! 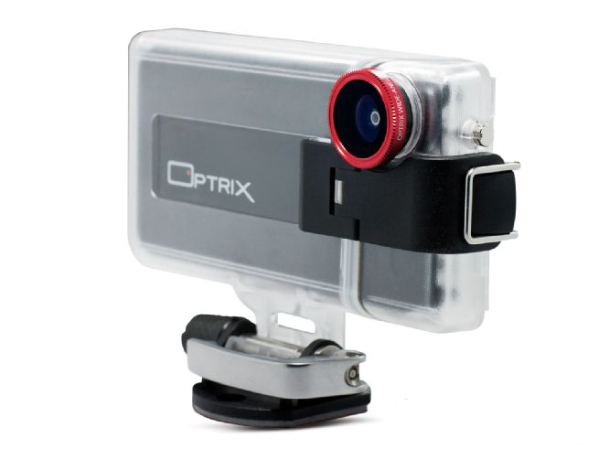 Optrix provides various mounts, some of which come with stock units and others which can be purchased as accessories. Many of these use plastic bases with 3M adhesive pads. Between the stock and your own semi-custom mountings, just about any type of mounting can be accomplished. One of the negatives of the iphone/optrix combo is that your sports camera is quite large in size – so don’t expect to get those secret vids with this one! However, if you put on your thinking cap you can devise other mounting methods (example: chest mount) which will not make you look as alien when filming. Zip ties and part of the orig. package were used to mount to helmet. I have not yet used the included adhesive pad because I’d rather wing it until I am certain how and where I am going to use the camera. I rigged up part of the case that the cam came in, and used zip ties in various arrangements to hold the assembly to my helmet. An example from today is shown here. 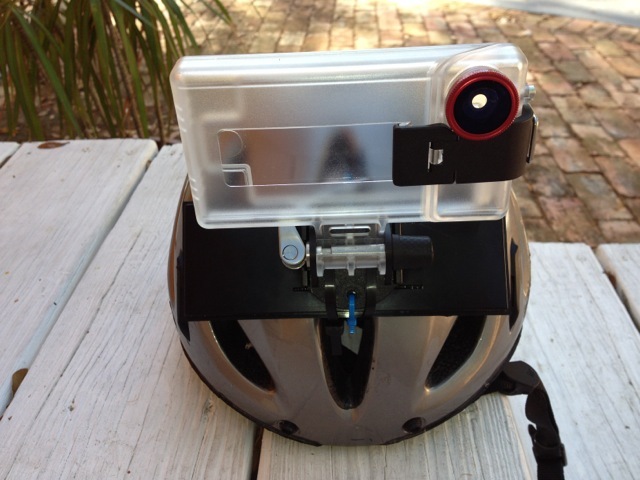 Notice that small ties are used to hold the cam mount to the case plastic – and then larger ties are holding the mount (the adhesive protectors on the bottom have not been removed) to the bike helmet. This worked fine, as you can see the Gillespie Park videos near the end of this review. The case comes with a rubber sled which helps protect your phone from shock. That case slip around your iphone and then the assembly slips into the hard plastic shell. 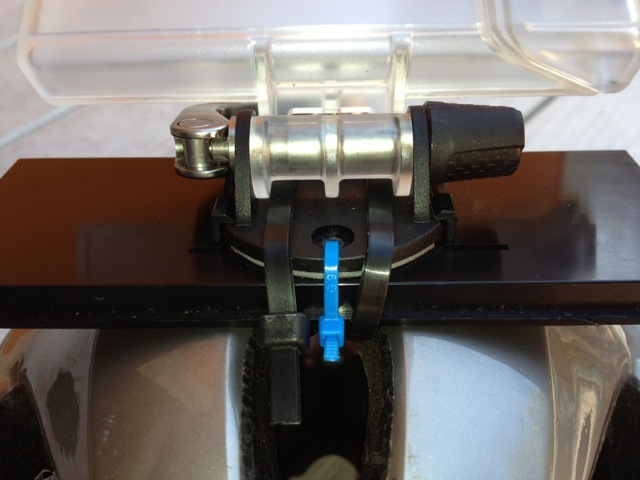 A small latch seals the hinged top and len onto the main body – and then you are ready to go! The rear features an heavy-duty membrane which is touch sensitive and waterproof. It does not respond as nimbly as your bare phone does, but it’s easy enough to do the basics which are required to shoot a video. All in all, assembly and operation could hardly be simpler. Here are some video samples – if you want to see more professional vids of snowboarding, dirt biking and race car driving, just google optrix and there should be plenty! Video #1 – Here is a 4 minute tour on my bike of a street and then Gillespie Park in Sarasota Florida. Note that, to save upload time etc., this video was only taken at 720p. But if you use the larger youtube viewer, it should still look good! Video #2 – this is a short clip at full 1280p – hand held. Summary – as with any accessory or tool, it is important that the buyer and user understand both the pros and the cons (limitations) of the device and technology. The Optrix cases are very good at what they do – that is to protect the phone while letting the tech already inside your device operate to it’s full capabilities. Optrix has even released some enhanced video apps to make things easier – check the app store! I’ve used mine quite a few times and expect to continue. In the end, that’s the best testament for a piece of technology such as the Optrix. Note – if you intend to do a lot of flying or bungie jumping with this cam, you may want to purchase the Squaretrade extended warranty or a similar program from your phone vendor. This will assure that even an abused (crashed) phone will not cost you a bundle to replace! Here is a video using the Optrix – of snow shoeing through the woods after the Nemo Blizzard of 2013 – Optrix starts about 20 seconds in.